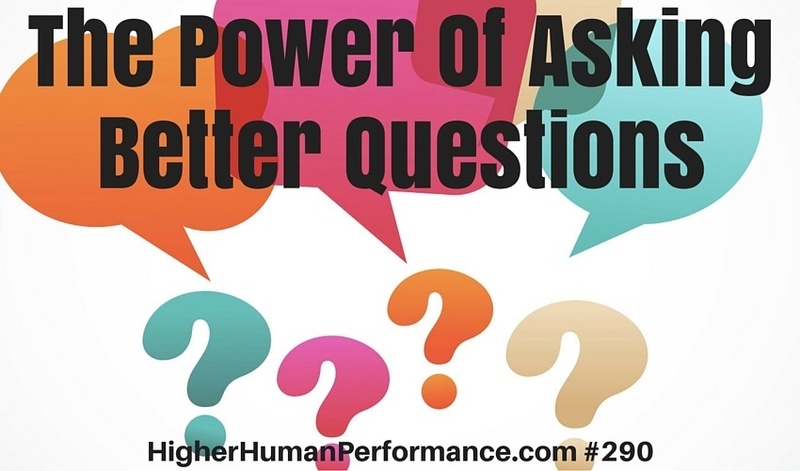 Spend enough time in sales and you’ll soon realize the power of questions. They serve to help you find out if you’re a suitable solution for a prospect. They also help you serve clients better. One of the first things I learned was how powerful questions are to learn more. Namely, about the people I was attempting to serve. A couple walks into the stereo shop where I was working as a high school kid. I was naturally curious about what they were looking for, why they might be looking for it and what kind of music they most wanted to play. First, I remember being curious about who is really doing the shopping here. Is it her? Is it him? Is he helping her, or vice versa? Only one way to find out. Ask. I was the naive sales guy willing to ask what others thought might be the stupid question. For me, it was less naiveté and more curiosity. There was also the practical element of it all. I needed to know so I could better serve them. I wanted happy customers. The road to happiness isn’t paved with good intentions or anything other than finding out what must be done, then doing what must be done. In this particular case she was looking for her first real stereo system – not one of those all-in-one affairs that was the starter system for many of us. She wanted to have a really good, albeit not too expensive system. His job was to make sure she didn’t get scammed. I figured as much. I didn’t ask the usual questions though. He remarked about that. Others wanted to know, “How much do you want to spend?” I never went there even I knew it was a perfectly logical question. The reason I didn’t go there was because it just didn’t feel right to me. It felt like I was just like everybody else and my big driver then (as now) is that I’m not like everybody else. That’s right. I’m better! If you’re going to be better than everybody else, then stop doing what everybody else is doing. Ask better questions. Prove you’re different. Better! We’re in the mid-1970’s. I don’t remember what her answer was, but it could have been anything from Pink Floyd’s Dark Side of the Moon to ZZ Top’s Tres Hombres to some Earth, Wind and Fire funk. Who can remember? Not me. I do remember the question taking her – and her boyfriend back. They came in for stereo gear. We talked music. I didn’t think it odd at all. Why did we want good stereo gear? That’s right. To play our favorite records. Yes, kids. It was the days of vinyl, turntables and phono cartridges. The boyfriend observed that my question wasn’t the first question they’d been asked elsewhere. “Don’t you want to know how much we want to spend?” he asked. Oh, I asked many more questions about her record collection including what her all-time favorite record was. Her favorite band. The last concert she went to. I knew she hated disco – beginning to be a thing about that time. I was happy about that because I couldn’t stand disco. She had roommates in college and didn’t want anything too big. Or too loud, except when they had parties. On and on this went as I put record after record on a turntable – the records she most loved, of course. Discovered only because I asked. My competitors hadn’t asked her these questions. They’d gone straight into pitch mode, trying their best to sell her whatever they could. I gave her time, attention and was genuinely interested to know what she most wanted in a hi-fi system. That was over 40 years ago and I’m still the same guy. I’m no longer selling stereo gear (sometimes I wish I were), but I’m still selling, serving people and trying to do good. Working hard to make a positive difference. I’m typically an impatient man prone to just get on with it. But in the rush to make a sale, I’m like a camel. I can go for long periods of time waiting as I build the relationship, finding out all I can, teaching as much as possible along the way. I know I’ve got my hang up’s. We all do. Maybe for me it’s the desire to appear genuine, knowledgable. I’ve never been too bothered about not being the smartest man in the room. I’ve long joked that even when I’m alone I’m not the smartest guy in the room. But I’m almost always prepared. It doesn’t mean I’m ready, but it means mostly I’m ready enough. 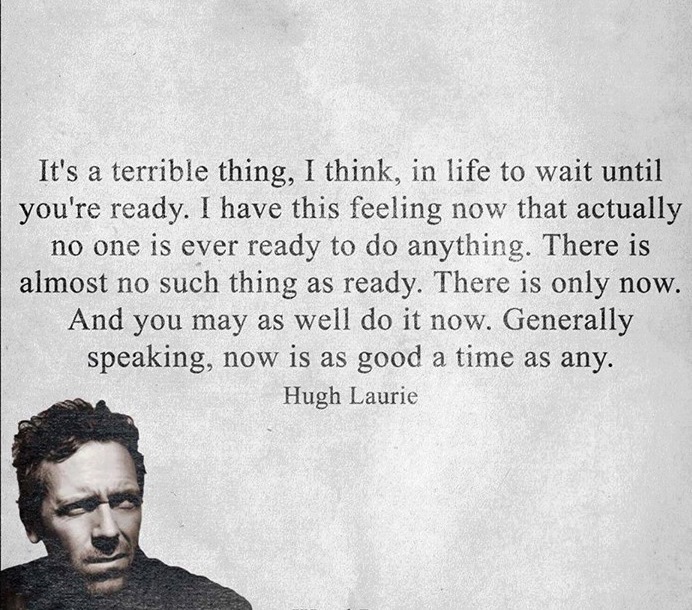 The other day I ran across this little graphic with a quote by Hugh Laurie, the actor who played Dr. House on TV. Pretty good, huh? I agree with Hugh. Now is as good a time as any. I just always figured it was up to me to put myself in the best position to make now be as right as possible. And with that, you’d think I might over prepare, but not so much. Perfectionism is not my problem. My willingness to accept imperfection is pretty high, but when you live behind my eyes — that’s just how you have to roll. You’ve heard the famous quote. It’s true. Conversely, I can tell how little you care by how little homework you did, or you little you care to find out what I think, or how I feel. Tell me, don’t ask. And I’ll confirm the shallowness of your concern for me. Ask me, and take the time to really listen. And I’ll know you likely care. Keep doing it and I’ll know how much you care. Speed dating just gets to a faster no I suspect for those who participate. Speed selling does the same thing. So I hope I’ve shown you that questions can make you stand out, stand apart from the crowd. They display your genuine care to learn more about the people you’re attempting to serve (those people who may buy something from you). They also serve to give you insight and information that help you make customers happy. Good salespeople are good servants. They don’t want returns, refunds or buyer’s remorse. Ever! Questions are so powerful they deserve more time than we give them. And more creativity, too. During my years running retail companies I was fanatically against hearing anybody in stores say, “Can I help you?” It screams, “I’m a salesperson intent on selling you something.” Instead, I taught sales staffs to simply welcome shoppers with a simple, “Good morning” or “Good afternoon” or “Good evening” followed by “Welcome to (insert the same of the store).” Then just shut up, but be attentive. Inevitably the shopper would ask the first question. It might be asking where something was located. Or something else, but the question they asked would be the ice-breaker where our staff members could begin to build the relationship by asking questions designed to help serve the shopper. The intent behind the questions is important. They must be designed to find out more in ways that demonstrate you want the person to be armed to make the best decision they can make. All the while arming you with the information you need so you don’t waste their time, or get it wrong. My college couple shopping for a small starter hi-fi system may have been willing to spend the money for a system that would play twice as loud as she’d ever play it, but it would have been the wrong system for her. How would that have helped me serve her better? How would that have given her anything good to say about me, or the store I represented? I wanted her to tell all her friends about me. I wanted her parties to be successful and for my name to be dropped as the guy who sold her that killer system everybody was enjoying. Getting it wrong would have negated all those things. Getting it right demands that you ask the right questions at the right time. And today, I’m challenging you to formulate better questions. Get outside the space you operate in. Your industry – whatever industry it may be – it overrun with “me, too” copycat-itis. Every industry is. We find somebody succeeding at something and instantly put it into practice never fully even knowing why it may work for them. Sales gurus peddle scripts guaranteed to bring in more sales. “We’ve tried this script on over 10,000 calls and we know it works.” Well, maybe so, but if you hop down that road copying it, sounding like you’re reading a script I guarantee failure. Besides, if you don’t take the time to understand the value behind it, you can’t own it. And if you can’t own it, then neither will your prospect. It’s not about scripts. My admonition about store greetings was a script of sorts. How we answered the phone was, too. But it was natural. It was easy. It was straight-forward, friendly and simple. Too many times we get wrapped up in contrivances that we think will “make” people buy from us. Listen, you’re not going to make anybody do anything they don’t want to. You may as well quit trying because it’s a waste of time and energy. Besides that, it’s wrong-headed. Instead, spend your time crafting questions that will actually help you help your prospective clients. Show them how much you care about serving them well…and getting it right. Do everything in your power to make them feel and understand how motivated you are to “get it right” for them. The crazy bottom line to all this is stupidly simple: care more. Care enough to prepare. Care enough to learn. Care enough to teach. Care enough to share. Previous post: 287 What’s Your Leadership In A Sentence?